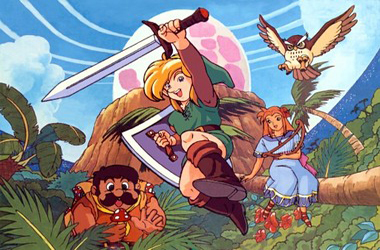 Link’s Awakening Release Date Confusion, Confirmed for Launch? UPDATE: Derp. As it turns out, several online gaming news centers reported false in formation. The Virtual Console, as we now know, is in fact part of the e-shop. Therefore, the Virtual Console, and Link’s Awakening, will not be available in March as we had hoped. A while back, Zelda Dungeon reported that the 3DS e-shop and Virtual Console would be available on the day of the 3DS launch: March 27th for the states. What we failed to report to you all is that for a time, the launch of the e-shop and Virtual Console would be delayed until May, at which point 3DS owners could get it on their 3DS with a downloadable upgrade. Well today, more news has come on the subject! As it turns out, the virtual console will be available at the time of the 3DS release! So far the only confirmed titles for the Virtual Console are Super Mario Land and more importantly, The Legend of Zelda: Link’s Awakening DX. The only trouble is, no one from Nintendo has given us a straight answer on whether or not these will be available on the 27th or not. It is, however, expected that we will see several other titles on launch day. My fingers are crossed! Who else is getting the 3DS on March 27th (25th for Europe)?